Men were sent on fatigues to fetch the guards’ food supplies from the railway station. Without horses they had to push the van for miles to Lentföhrden. Along the way they took any opportunity to scrounge vegetables from roadside farms and pocket food from the German supplies. Men caught stealing guards’ bread had their own bread ration withheld for four days. The Commandant stopped the issue of Red Cross packets because no prisoners would volunteer to fetch bread from the station. The men were made to parade, seemingly until volunteers stepped forward. Finally 50 men volunteered, but the men did not move until the Commandant agreed to start issuing packets again. “Strafe parades” were called with short notice, sometimes twice a day. The men had to parade and display their towels, blankets or mattresses. If it rained during the parade the men returned to their bunks with sodden bedding. The Sergeant Majors were shut out of their bunkhouse for a day for not removing a stove as ordered. In late August 1918 all cricket and football was stopped because too many windows had been broken. The Germans demanded that the prisoners pay for the damage – not just for the broken windows adjacent to the sports area, but for all broken windows throughout the camp. The games soon resumed. Two weeks later a football game was stopped and the ball confiscated, seemingly because the prisoners were enjoying themselves too much. The guards claimed that the shouting and laughing were upsetting the camp’s neighbours. Sergeant A.E. Mead noted drily that there were only two houses within a mile of the camp. The prisoners had formed a band and purchased instruments. The Commandant asked the band to play in the camp square, but the band refused. The Commandant cancelled the evening concert as a consequence. It seems that as numbers in the camp grew, arrest and confinement in the punishment cells became more common. Perhaps this was a way of managing the shortage of beds in the crowded bunkhouses. Men were given 14 or 21 days ‘in the jug’ for standing or sitting during morning exercise, or for making a fire for cooking or warmth. The German camp interpreter was singled out as a key antagonist, someone who would find any excuse to put a man in the cells on bread and water. While there is some truth in the newspaper description of Springhirsch, we can also detect the exaggeration and bravado of freed prisoners of war. These men wanted to show that they had not failed in their duty or dishonoured their country by being taken prisoner; that in the camps they did not capitulate. Not all Springhirsch prisoners’ experiences were the same when it came to food rations. For the men reliant on Jerry food there was plenty to complain about. Breakfast at 7am was bread and ersatz coffee – or just coffee if the bread had not arrived from the train station, or a man had eaten his ration when it was issued the evening before. The 4pm meal was the main meal of the day. It was often some combination of vegetables and rye or barley meal. Depending on how much water was added it could have been a broth or a porridge. The vegetables were generally poorly cooked and might have been green, rotting, or gritty with sand. Sauerkraut was served regularly, and just as regularly thrown into the swill trough by many prisoners. There may have been a little horsemeat or some other indeterminate meat added, perhaps tasting of disinfectant. The evening meal was usually a soup of some kind. A ration of a tablespoon or so of cheese was issued before lights out. Extra cheese was issued from August to prevent diarrhoea. Sergeant A.E. Mead’s diary mentions the Old Hands, men who had been in Springhirsch since well before the German Spring Offensive of March 1918. These men received regular Red Cross and private parcels; for the most part they could live on the contents of their parcels and so did not draw their Jerry rations. New arrivals had to wait for the Red Cross to catch up with their whereabouts before they could expect any mail. The men might receive packets of clothing, groceries, biscuits or tobacco from the Red Cross or home front auxiliaries, and private mail from family. Australia. 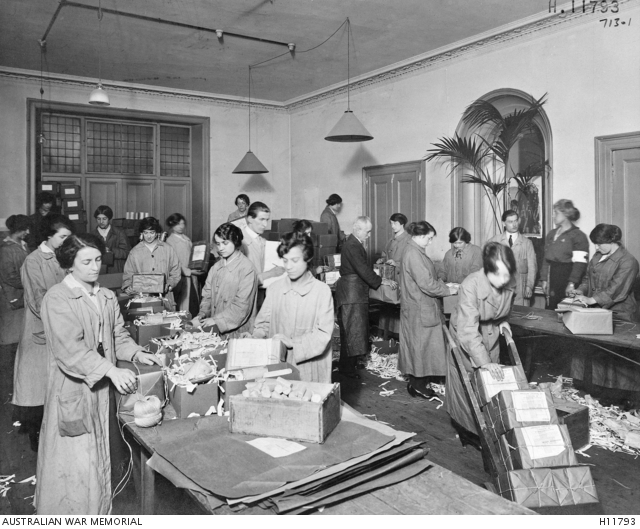 Australian Red Cross Society workers packing food parcels for Australians held in prisoner of war camps. Parcels did not arrive regularly at Springhirsch. When they did, not all men received them. While Andy waited for mail he might have shared a Commandant-issued emergency parcel to tide him over. The Sergeant Majors had their own bunkhouse and own mess, so even though Andy was a new arrival his meals would have been supplemented at least by shared parcels. From Andy’s letters home it is clear he did not like having to rely on the charity of others. By late August packets were arriving late or not at all. It is very aggravating to see the fellows who are lucky enough to get parcels eating all the nice things and we have to be content with pigs’ food. Still we keep on hoping and our turn will come. By September the arrival of parcels had slowed to a trickle. Even many of the Old Hands were on Jerry rations again. This situation was to continue until the end of the war. Smart, J., 2013. 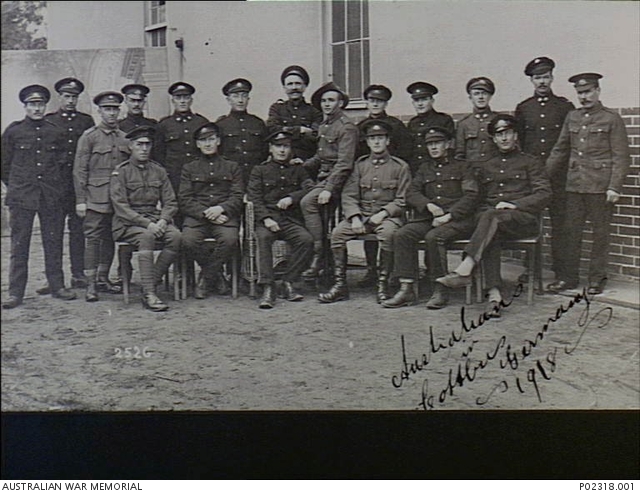 CAPTURING CAPTIVITY: Australian Prisoners of the Great War. He has been in three German camps – Dulmen, Parchim and Springhirsch – the last being a strafe camp for N.C.O.’s who refused to work. While at Parchim the Germans tried to force British N.C.O.’s by all means possible to work, but the Cambrai men stuck together and eventually were sent to Springhirsch near the Kiel Canal, where they were joined by several hundred more, who were captured in March, 1918. The return of Sergeant S. Mugford, prisoner of war.